I'm pretty positive there is no better pairing in the world than wine and chocolate. Except for maybe wine, chocolate AND cake. I mean my head can't even wrap itself around that combination (#isthisreallife). And then there's this cake.....are you ready for your mind to be blown? Because it will be. 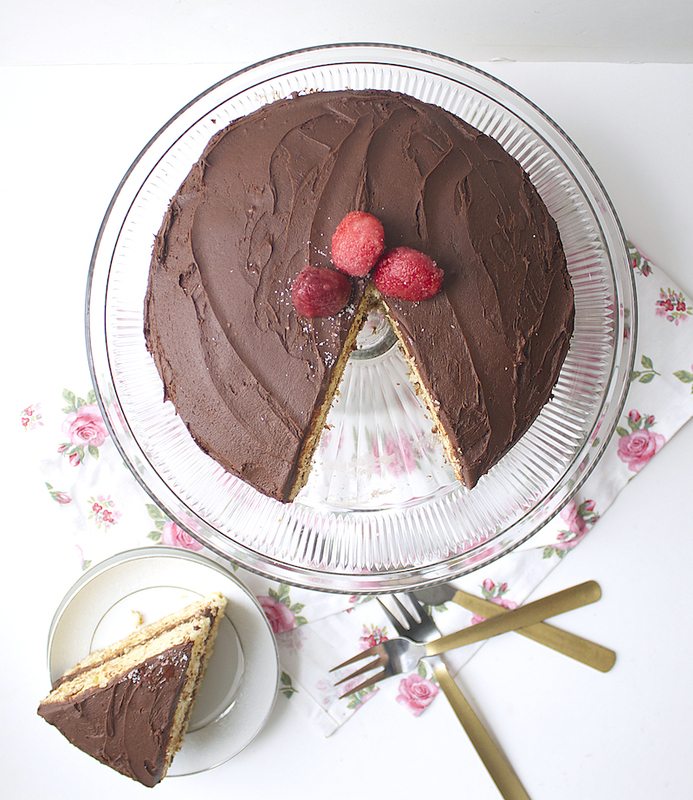 Because this cake is made with wine and chocolate. Like as in wine, chocolate and cake all together in one delicious masterpiece. Game. Over. Basically, way back, when I was a wee little thing, my Mom would make this yellow cake on a frequent basis. While I wish I could say I was a smart little tyke whose flavor palette begged for me to sneak some of the wine, I was only after the chocolate frosting. Wine cake? Forget about it! Ever since Luci posted her wine cake, though, I haven't been able to get my Mom's favorite cake out of my mind and I knew I was long overdue for a Great Yellow Cake fix (also, I came to my senses and realized "What idiot doesn't like wine and cake together?! Or just plain wine for that matter?!"). Now, the only difference between me making this cake and my Mom making this cake, is that I'm sneaking samples of both frosting AND wine! To make the cake: Preheat the oven to 350 degrees. Grease and flour two 9-inch round cake pans and set aside. In the bowl of a stand mixer, add the sugar and eggs and beat on medium speed for 30 minutes. Next, add in the oil and wine and beat for another 30 seconds. Add the dry ingredients and vanilla, and beat until mixed, about 1 minute. Divide the batter between the two pans. Place the pans on the middle rack of the oven and bake for 20-30 minutes, or until the cake starts to pull away from the sides of the pan and a knife inserted in the center comes out clean. Let the cakes cool in the pans for 5 minutes, then turn them onto cooling racks and let them cool for at least 2 hours before frosting. To make the frosting: Combine chocolate and butter in small saucepan and melt over low heat, stirring constantly. Remove the pan from the heat then stir in the milk and vanilla and transfer mixture to a mixing bowl. Add the sugar gradually, beating the mixture on medium speed until it's smooth (it will be runny). Refrigerate the mixture for 1 hour, beating it every 15 minutes (the icing will stiffen). If you won't be around to beat it every 15 minutes, simply refrigerate it, then when you're ready to beat the mixture, remove the bowl from the fridge, let it sit out for 15 minutes and then beat the mixture. 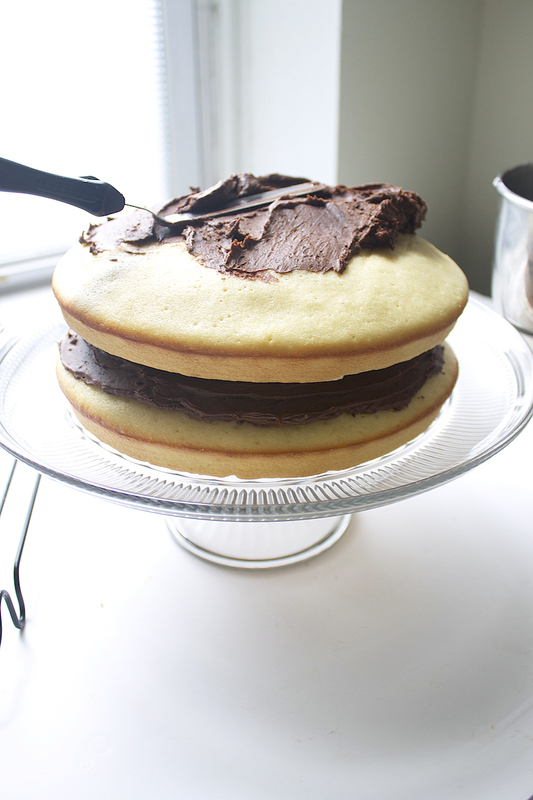 To assemble the cake: After the cake has cooled, place the first layer on a cake stand or serving plate. Spread on about 1/3 of the frosting. Place the second cake on top and cover with the remaining frosting. To store the cake: Cover with plastic wrap. The cake will keep well for 2 days out of the fridge and 5 days in the fridge.